The SunWolves beat the Waratahs in New Castle, New South wales of Australia on the 29th of March. It's their second victory. Though the home team scored the first try, it was a close match and Semisi Masirewa scored a hat trick (three tries) for the SunWolves. Besides, Hayden Parker kicked well. Unlike some of the previous matches, they tried not to commit a foul and tackled their opponents. It was a joy and I hope they will beat the Rebels at AAMI Park in Melbourne next time. And SANIX WORLD RUGBY YOUTH TOURNAMENT, a rugby tournament for high school pupils from home and abroad will be held this year also. This is sponsored by SANIX, a company of environmental hygiene and recycling. The tournament is held at GLOBAL ARENA in Fukuoka managed by the sports promoting foundation of the company. And it is held during so-called Golden Week, a holiday season from the end of April to early-May. Not only the tournament of men's rugby, that of women's is also played at the same time. It's decided that the SunWolves will be excluded from Super Rugby after the end of the 2020 season. 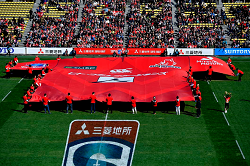 The reason is that the Japan Rugby Football Union (JRFU) are not one of the stakeholders of Super Rugby and it needs to pay 100,000,000 yen (about 9,000,000 US dollars) if the SunWolves hope to continue playing. But the officials especially Noriyuki Sakamoto, Managing Secretary of the union says it is impossible to collect the money at once though the Nikkei says that SANZAAR that manages Super Rugby told the union about it more than an year ago. Anyway, the union should have negotiated with SANZAAR more skillfully and have to plan and establish a new international competition to strengthen Japanese internationals after the World Cup this year. However the retirement of Ichirō Suzuki who is a famous baseball player puts the news in the shade in Japan. 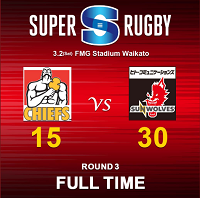 On the second of March, Japan's SunWolves beat the Chiefs in their home Hamilton, Waikato. It's their first win in their away matches since 2016. It's a surprise and a joy for us. The Sunwolves will meet the Blues next weekend. However, World Rugby is said to plan a new international tournament played by the six nations of Europe and the four nations of the Southern Hemisphere. The organisation also plans to add Japan and the US to it. But Fiji, Samoa and Tonga oppose it because they cannot join the tournament and are said to boycott the World Cup that is to be held next autumn in Japan. On the other hand, some officials in the Japan Rugby Football Union say that Japan should withdraw from any international tournaments except the tests by national teams and Japan Rugby Top League should be improved more. But I cannot agree with it completely. The details of the new tournament has not decided as yet according to World Rugby. Super Rugby is a competition of men's rugby union from five unions - Argentina, Australia, Japan, New Zealand and South Africa. Its origin was South Pacific Championship in the 1980's but in 1996, it started as Super 12 as a competition of professional teams. In 2006, it changed its name into Super 14 with the addition of two teams and in 2011, three teams joined and it expanded to Super Rugby. In 2016, the Jaguares (Argentina) and the SunWolves (Japan) joined and in 2018 the competition was reorganised and two South African teams withdrew from it. Current franchises are as below. The results of the SunWolves was not so good until now. Regrettably, they lost the match by a narrow margin (1 point) by the Waratahs at their home Prince Chichibu Stadium. A big shirt was shown at the stadium before the kickoff. Japanese national team played against New Zealand (All Blacks) at Ajinomoto Stadium in Tokyo on the 3rd of November. Then they flew to Britain and played against England. 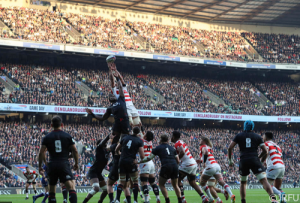 Though the team were beaten, Japanese internationals said that it was an honour to have a match (test*) against England at Twickenham. Japanese international Akihito Yamada says in his tweet, "the play was priceless". And then they played a match with Russia. Though Japan were confused with the kicks of Russian players in the first half, they gained tries and at last they won a come-from-behind victory. In the World cup held in Japan next year, Japan will meet Russia in the opening match. 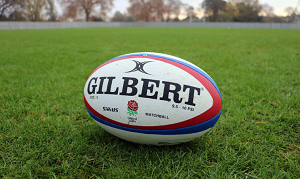 (*) Like cricket, international match is called test in rugby. It equivalents A match in soccer. The images are from the official website of Japan Rugby Football Union. As the World Cup of rugby will be held in Japan next year, I will occasionally post the entries on Japanese rugby. There are three major fixtures. National league matches played from August (late summer) to January (mid-winter). 16 teams join the league and the tailender is demoted to the Local league. Instead, the top team of the local league who won the playoff is promoted to the Top league. Internaional league matches (New Zealand, Australia, South Africa, Argentina and Japan) from February to July inserted "window month". 15 teams join the league and play total matches home and away. This is a Japanese-English that means a month for international matches. Until 2018, the matches were played in June and November. But from 2019, they are to be played in July and November. For your reference, I put a link of website of the JRFU below. Former All Black Jonah Lomu passed away at the age of 40.